Are you a kid, or a squid? This is only one question Splatoon 2 asks its players. The third person shooter is a follow up to Nintendo’s 2015 franchise debut, which was received pretty well amongst fans and critics. Splatoon 2 brings more of the same action, with a few new modes and, of course, unlimited portability. Does Splatoon 2 bring enough new to the party to warrant a new purchase? For those unaware, Splatoon 2 is a third person shooter. Players take control of Inklings, which are teenager and squid hybrids. Inklings carry guns that look like water guns, and shoot colored ink at the environment and at each other. This is the basic premise for all modes of play. Even though it doesn’t change much from the first Splatoon, it feels great and works well. There are single player, local multiplayer, online competitive and online cooperative modes. We already have more content than we had in the first Splatoon, which lacked an online cooperative mode. It is a bit of a downer to see that everything else in the game is similar with new challenges and slight refinements. Such is the case with the single player. This mode, while containing the story of the game, really acts as more of a way for people to play the game offline. 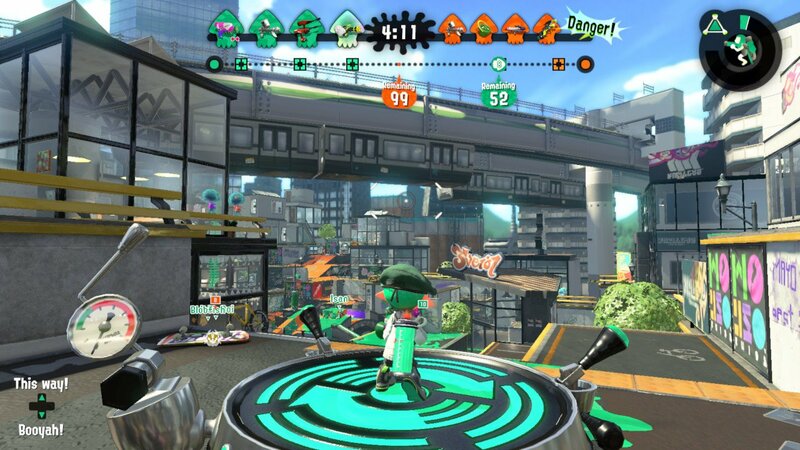 The draw of the Switch as a mobile console means that to really enjoy Splatoon on the go would require a single player game more, or local multiplayer. The single player is satisfactory and fun, but at the same time, it isn’t on the same level as the multiplayer. It will do in a pinch, but it is not the main draw for Splatoon 2. When it comes to the different modes, each one offers something different, and they are all great. Objectives are different enough to warrant playing them all. Salmon Run, the new player versus environment mode, pits teams of four against salmonids, which are salmon like creatures. Players collect their eggs while equipped with predetermined sets of random gear. This mode can get tricky, but is great fun when competitive games get stale. The biggest problem Splatoon 2 faces though, is the connectivity Nintendo offers through the official Nintendo Switch smartphone app. In many instances, this is the only way Nintendo will handle voice chat and explicitly partying up with friends. This is totally obtrusive. The app itself is well made and offers reasons to use the app, just not to connect to other players. The gameplay is another factor that has not really changed from the first game. You outfit your squid with a unique loadout. You select weapons and clothing to suit your playstyle. It is important to note that each item of clothing and weapon have different stat bonuses to assist in different play types. Getting into the nitty gritty, players move through smallish arenas in order to compete for objectives or simply ink the most ground. “Small” is not a derogatory term. The arenas are the perfect size for the game. The arenas get used, and in the course of a single game, there is a good chance that any given player will see and utilize most of the map, unless they are playing a specific objective or goal. The gameplay itself is ultra tight. Characters control well, and respond to even the slightest change of motion control input. 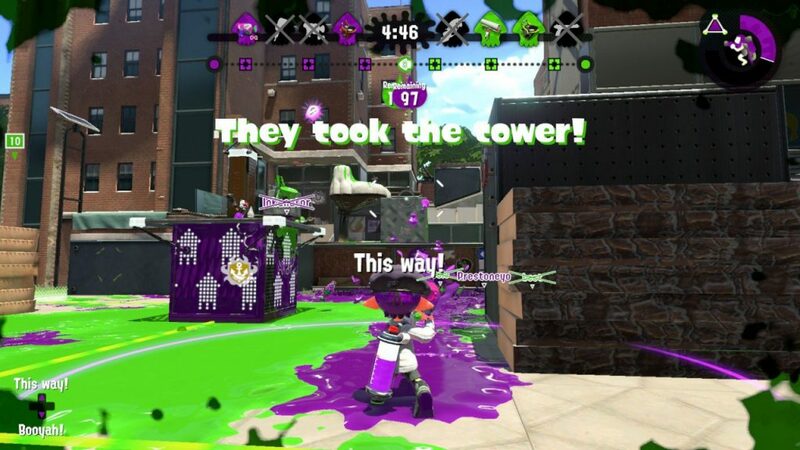 Players can turn into squids to swim through the ink at increased speed, heal and also recover ink to shoot at enemies. Combine this movement versatility with the sheer vertically and variability of the maps and even traversing the maps is a joy. It is also important to mention that while this game is for sure not a platformer, a skilled player can pull of some impressive traversal moves. The game plays the same in all game modes, the only things that change are objectives and who the player is playing against. The experience is always tight, regardless of whether the player is playing in handheld mode or via television mode. There are a few things not up for debate when it comes to presentation. This game looks super colorful and whimsical. The music in Splatoon 2 seriously rocks. I could probably leave it there, but that does not explain how truly colorful the game really is. 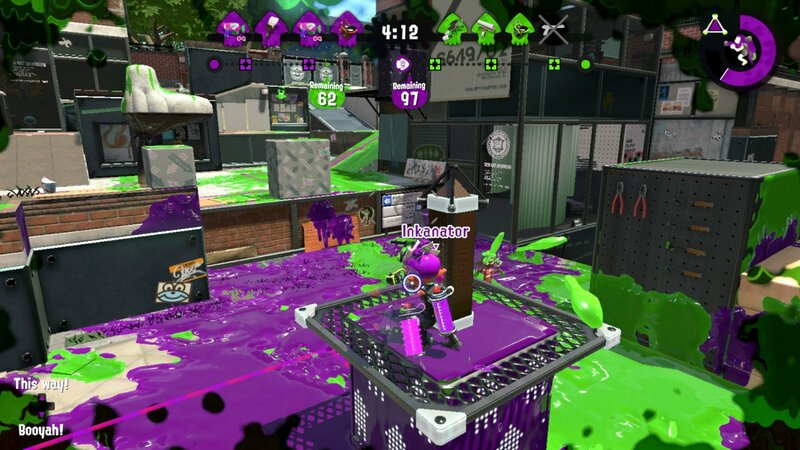 Different ink is used in each and every match. This means the colors continuously change and the game always looks fresh. The aesthetics are sharp and defined. You’re never confused about who controls what land or anything of that nature. The music is somewhat limited, but it is just as poppy and fun as the music in the first game. I truly enjoy listending to the upbeat music while running around with my ink guns. Nintendo set a precedent of long term support when the first Splatoon launched. That game was supported with new gear and events for about a year, and Nintendo has explained that Splatoon 2 will be getting the same treatment. A number of new weapons have already made their way to the game, and I can’t see what else the big N brings to the table next. Splatoon 2 doesn't bring a whole lot new to the table from Splatoon. The game adds a new mode and revamps the single player, but the gameplay is as rock solid as ever. The long term support Splatoon 2 is receiving means that if anyone is on the fence about jumping into this stellar franchise, now is probably a great time to do it.